How he got his name - flyTrapper! Ask for Price SALE *A Color Champ Too! 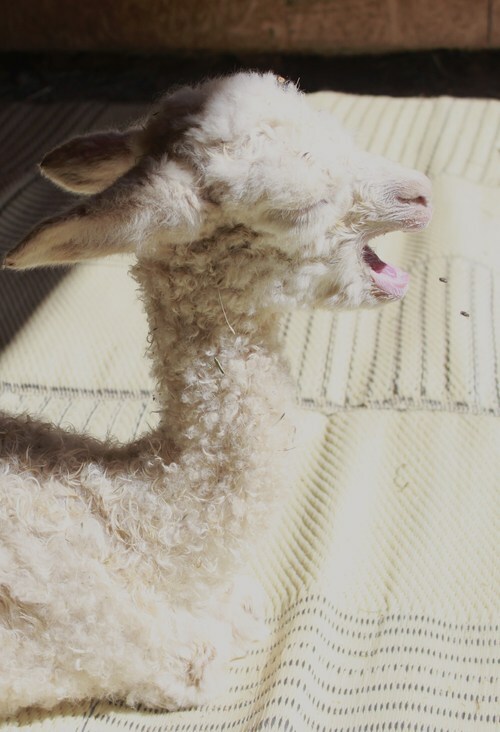 Trapper is quite the handsome beige/white young male with a awesome personality and that rare light beige fleece. 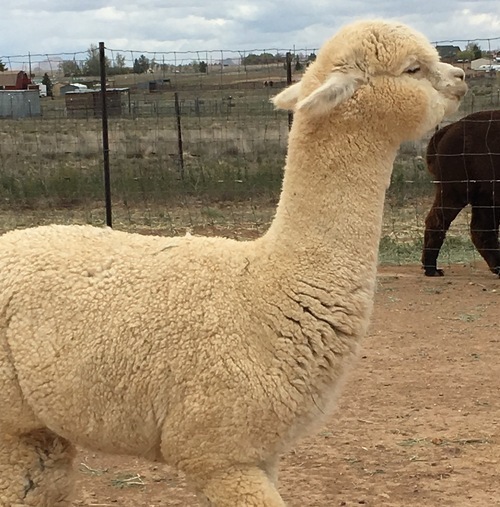 His fleece is just amazing and we expect a bright future for this boy - who's sire is well known for champion offspring. Trapper attended his first shows as a weanling and yearling in 2013 and took home ribbons from both shows! 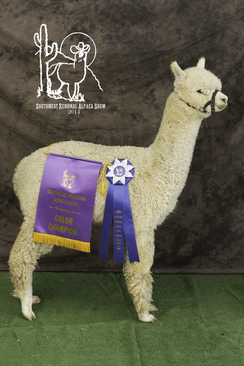 He was awarded 2nd place at the 2013 SW Regional Alpaca Show (Norco CA) in a tough class. He went on to 2013 GWAS and took 3rd where judge Wade Gease marveled at his conformation along with his fleece characteristics. He shows nice bundling, soft handle and great staple length, while sporting perfect conformation to support those great fleece traits. 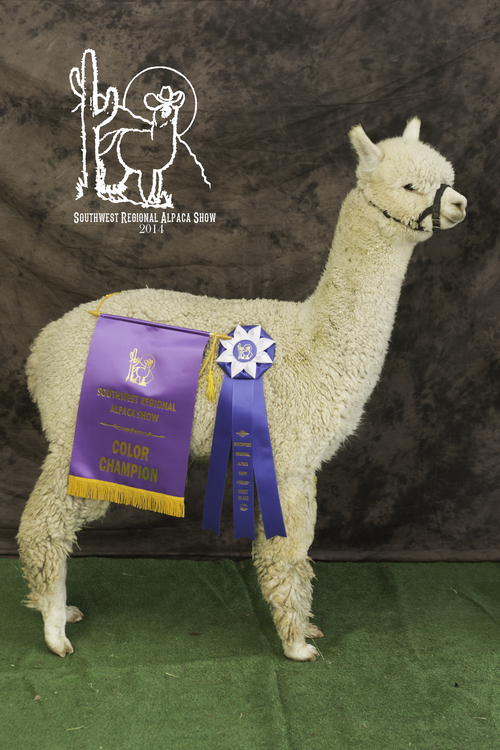 2014 update: Trapper is SW Regional 2014 Light Male Color Champ awarded by Amanda VandenBosch. We heard loads of comments on his extreme 'brightness' and fleece characteristics that carried consistently through blanket and up neck. He has a great personality to boot! 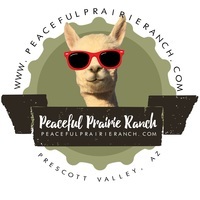 2015 update: Trapper was awarded 1st place in his white 2yr old males class in Norco at AlpacaFest West... He continues to hold softness and character into adulthood. 2016 update: Trapper took a 4th at GWAS! Tough show...judge Helen Testa commented on softness of hand and uniformity! He is almost 4 years old.. Trapper is now home and has started his breeding career - settling females on first breedings (with two maidens!) 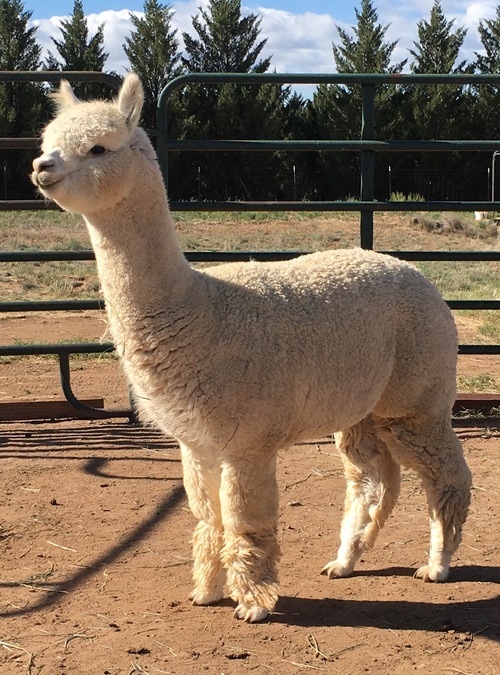 he now has two male cria on the ground as of 11/2017 - one exceptional white and one light/medium fawn. Trapper carries color genes. 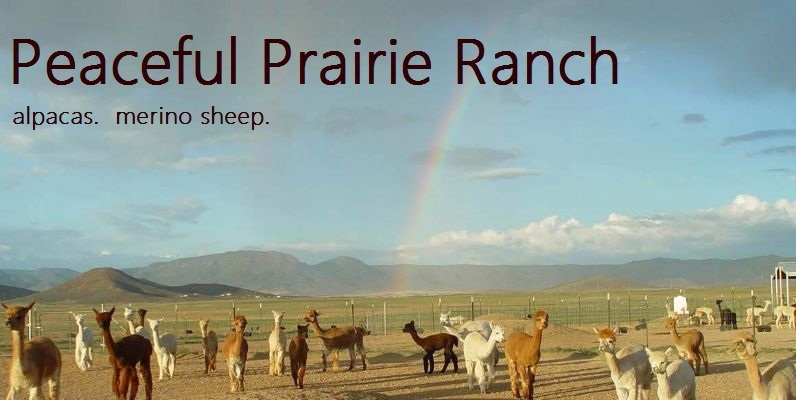 We would love to share partial ownership with another farm in this very nice BEIGE herdsire. Contact Wendy to discuss options!